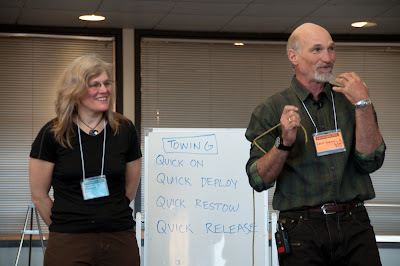 Mention Canoecopia to midwest paddlers and they fairly glow with pride. The world's largest paddlesport expo happens here--in Madison, Wisconsin, to be precise--every March. Take that, coastal paddlers! Kelly Blades, P&H Midwest Guy, shows Sharon the new Delphin 150. Canoecopia is a hybrid trade show and symposium. The expo hall is filled with vendors of boats, paddles, spray decks, clothing, safety gear, tents and other paddling and camping necessities, along with outfitters, schools, publications and more. Meanwhile, there are ten presentations every hour for two and a half days on a wide variety of topics, and the entrance hallway is lined with clubs, nonprofit groups and other organizations. Shawna Franklin and Leon Somme of Body Boat Blade present "Tow Systems," dispelling many misconceptions about this essential piece of safety gear. Many people come for the access to an astonishing variety of gear and the 15 percent discount. But to view Canoecopia as a chance to get deals is to miss the point. 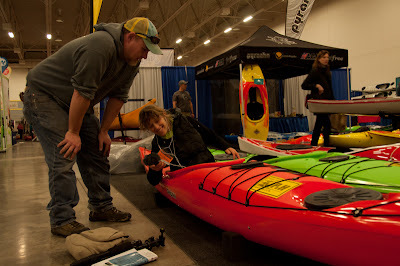 Rather, we're drawn to Canoeopia every year because it's an opportunity to see and touch all that's new, to hear the latest ideas and learn about the adventures and innovations of the movers and shakers in paddlesport, and to connect or reconnect with friends and contacts throughout the industry. Nigel Dennis talks to a customer about his SKUK boats. Here, under one roof, you can have a detailed discussion with Nigel Dennis, owner of SKUK and designer of its boats; Peter Orton, who designs the Valley line; and Graham Mackereth owner of P&H. You can talk with the top salespeople for paddling gear manufacturers, like Danny Mongno of Werner Paddles, Brian Cooke of Level Six and Jeff Turner of Kokatat. You can get maps and guidance from Parks Canada, sign up for a course with Wilderness Medical Associates, and talk to the publisher of the Rapid Media magazines. As Morgan Goldie, sales manager of Northwater, mentioned in an off-hand comment, "If the roof caved in right now, we'd lose the brain trust of paddlesport. It would be devastating for North America." 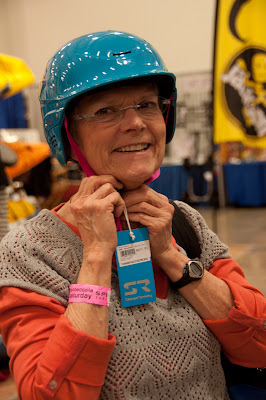 A wristband-wearing customer tries on a new helmet. Fortunately, the roof didn't cave in. 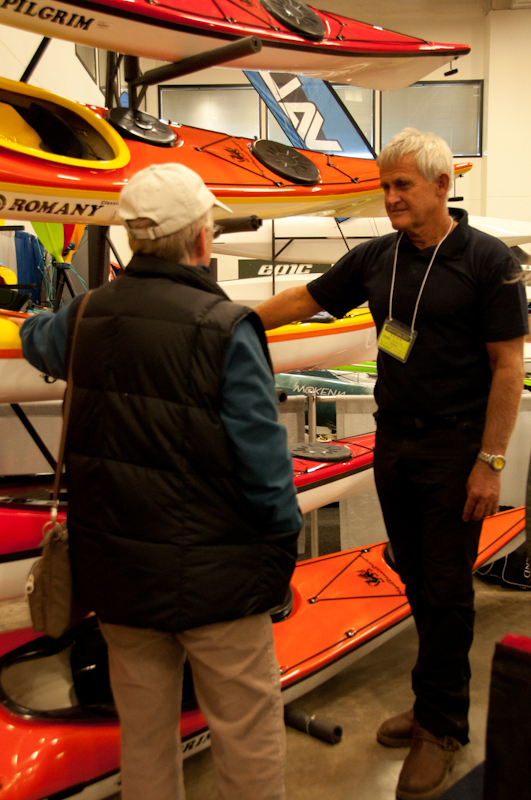 It was the biggest show yet, measured in traffic and sales, but by midnight on Sunday, Canoecopia had packed up and left. And true to the outdoor ethic of leave-no-trace, the Alliant Energy Center shows no evidence that Canoecopia was ever there.